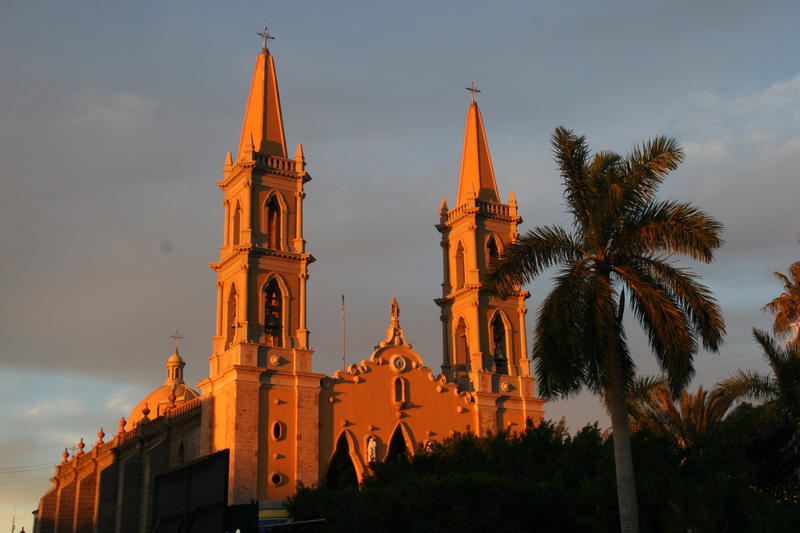 Here’s something fun to do when you’re bored in Mexico: Listen for church bells (this won’t take long), and when you hear them, try to figure out what they mean. If you do, let me know. They always seem to start out with two really loud clangs, I guess to get everyone’s attention, or maybe just to wake up the dogs that sleep all day so they can bark all night. The double-clang is then followed by an unpredictable number of spaced clangs. This doesn’t seem to have any connection to the time, since church bells can ring at 4:16 PM or 6:50 AM, or any other time. At first, I thought the church’s clock might just be off. After all, most of those clocks probably date back to Pancho Villa, and moving oversized clock hands can’t be easy, either. But there still seems to be no connection. When bells ring at 6:50, for example, they don’t ring seven times. Instead, you hear the two-clang wake-up followed by something like thirty-seven clangs. If you’re thinking this could be thirty-seven O’clock in Mayan time, remember these bells are all in Catholic churches. I’ve also wondered if they could be a community warning, like for an air-raid or a fire. but you rarely see an airplane in Mexico and something is always burning, so that doesn’t work. Thirty-seven, by the way, is not just some random number. I’ve counted these clangs a lot, as you can probably guess, and I hear thirty-seven clangs more than any other number. In fact, I’m sure no other number appears with the same frequency. Just for the record, I have never heard forty-eight or sixteen. Sometimes, especially in towns with lots of churches like Guadalajara, you get treated to variations. One day I heard the usual double-clang wake-up, followed by a very melodic carillon. This was the only time I ever heard this, though, and even it was followed by thirty-seven clangs. Speaking of Guadalajara, I took a city bus tour of the place, which was very informative. The information all came over a loudspeaker, so I couldn’t ask any questions. But the anonymous guide did talk about church bells a little. He didn’t solve the mystery of the bells, but he did point out one of the churches with a tall bell tower and a clock. When the bells in this church toll, the twelve apostles (well, twelve facsimiles) rotate around the top of the tower. Like cuckoos. I need to get this church bell thing solved soon, since there are other puzzles in Mexico that need attention. For example, why does the garbage truck in San Miguel come on Friday one week, then Wednesday the next, Tuesday a week later and then not at all for two weeks? I’m working on it.